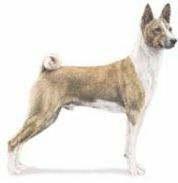 Basenji dogs are native to central Africaand are a very old breed. There is evidence of this from depictions of their likeness found in Egyptian tombs, though there are differing opinions about the breed's ancestry. Some believe that this dog descends from the Spitz breed due to its physical similarity. While others, think it was developed from pariah type dogs in congo regiaon of Africa specifically as a hunting dog. There is no doubt of its bravery, stamina and excellent ability to hunt, both by sight and scent. And these skills are still used in its native lands to this day. One of the most unusual facts about the Basenji is that it does not bark. It does, however, make other noises which sound similar to laughing or yodeling. This breed of dog has an elegant, well-balanced look and carries its body with a confident posture. The face has a very alert expression, but the forehead creases tend to give it an inquiring gaze. Color variations: Red; black, black and white; red and white; black, tan and white; black brindle and white. The coat is sleek and fine. The Basenji dog is almost odorless, has very clean habits and likes to take care of its own grooming, much like a cat. And, also similar to the cat, they don't like water or going out in the rain. This breed has a flat coat that sheds lightly all year round. Although the coat hair is short it still needs to be brushed a couple of time a week to remove the dead hair. This can be done with a deshedding glove or tool very effectively especially after a bath when the coat is still damp. An optional tool for short-haired dogs that is popular is the curry comb. In addition to a regular brushing routine, teeth and ears need to be cleaned about once a week and nails inspected for clipped if necessary. Be gentle and use caution when cleaning the ears. Generally a bath is only required every couple of months. Basenji dogs are friendly and affectionate, but they are also known to have a proud and independent side to their nature. They are cautious, though not aggressive, with strangers and like to be approached on their own terms. This dog is very intelligent and known to be crafty in getting its way. Owners need to be able to stay one step ahead of them to maintain their leadership role. Basenjis are very fastidious and are reputed to be easy to housetrain. and co-exit well with other dogs. It is very curious and fun-loving and likes to play a lot. They don't enjoy being left alone and tend to get into mischief if bored. Toys are very welcome diversions for them, especially indestructible dog toys to satify their insatiable interest in chewing. Even though they don't bark, they are good watchdogs and will let you know, through a repertoire of other noises, if there is something you should check out. This breed has a lot of energy and needs a daily walk. They also really like to play, so if you want to burn off some of that energy, take them out for long daily walks. The ideal environment for Basenji dogs would be any residence that has ample room outside to run and play. Apartment is not a good choice due to the high activity level of the breed and the need to get outside for exercise. Also, Basenji dogs don't like being left alone and are likely to start "yodeling" or making sad noises which sound like a baby crying, which may be confusing to neighbors. A good dog for older and more mature children who can convey leadership. The caution remains no matter what the breed, that activities involving children and pets should always be supervised by an adult. 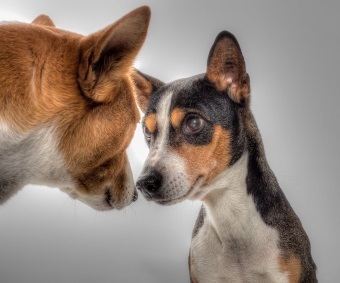 While Basenji dogs usually bond deeply with humans in a caring and affectionate way, this breed may not be suitable for families that cannot provide significant daily walks and other exercise opportunities. Traces the story of this silent "barkless" dog, which is still used for hunting in some parts of Africa. Known as the "all-round hound," the Basenji now competes in agility and obedience competitions as well as having a role as a show dog and companion. This is a breed with unique characteristics and expert advice is given on all aspects of care. Illustrated in black and white. Many dog breeds originated on the continent of Africa. The native African dogs are divided into seven basic types. Maps illustrate where the dogs originated, and the author covers the history and characteristics of the various breeds. Fully illustrated reference.